Denis, can you describe your new role at Rugby Players Ireland? The title of my role is Operations Manager and essentially the core of my role is to facilitate the flow and better use of information within our organisation and membership. I will be a key point of contact for players for all legal, insurance or contractual issues. Regarding retired players, I am aiming to develop a “Past Player Social & Business Network” in each of the provinces which will both connect/re-connect past players in a more structured and useable format. This in time will hopefully become a natural resource for players transitioning out of the game and for those looking to widen their database of contacts for their own careers. 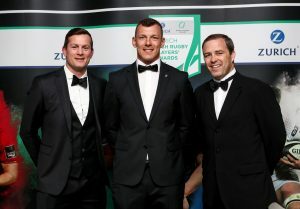 Other areas of the role will include working alongside Simon Keogh (CEO) in all negotiations with the IRFU as well as continuing and developing commercial relationships and helping to coordinate Rugby Players Ireland events. The one thing that I want to focus on is to develop this past player network which I hope will offer support, guidance and work contacts for transitioning players when they go through the process of retiring from the game. Every former professional that I have spoken to sees that the retirement process as being the main area that they feel could be supported a lot better and I aim to put in place such structures that may be aid this in some small way to begin with. You have been living abroad for some time, was the time right to move back to Ireland? In many ways, I probably need to explain why my wife and I made the decision to move in the first place. I had been with Munster for 12 years and living in Cork all that time so when I retired I felt I needed some time away to establish myself in the working world. My game-plan was to be still in the game for a further 2 years which would allow me to get my plans in place but when circumstances forced me to hang up the boots, I still wasn’t sure what I wanted to do. We had some close friends and family living in Dubai, so we saw it as a great opportunity to get away and to get some real-life experience in a hot climate. Why Not?! My wife and I enjoyed the new adventure. I got a lot of great work experience out of Dubai, but we knew after a year that it wasn’t the place for us as a family in the long run, so we are very happy to be home in Ireland! Was it difficult to develop a network in a new country? The time away in Dubai was tough going as it was an unstable economic environment, businesses were and still are on edge as to what way the economy is going in the short-term never mind in the long run. For somebody like me, without any real work experience since I finished college, I had to adapt as much as possible. Being thrown in the deep end, landing into Dubai without work, meant I had to find an income sooner than later to support my family. Nothing like a bit of reality to give you a kick up the arse and get out meeting people. I contacted any and every contact I was given and tapped up any contact of line of interest that I came across. Is it difficult in a new country? Yes, but there’s always an Irish network to get started with! How did you find the transition out of the professional game when you retired in 2016? I felt I had been left go from Munster when I had been struggling with an injury for 6 months so there was little love lost between myself and the professional game. That alone was a hard pill to swallow and took me some time to figure it all out in my head as well as plan for my next career and what that was going to look like. I got into coaching with Dolphin RFC and with the Dubai Exiles which I found was a great focus and enjoyment of being back involved in a team environment as well as throwing on the boots again a few times. Did you stay in contact with your former teammates? The reality is that the wheel keeps turning regardless of whether you are in or out of it. I found it difficult to have a meaningful conversation with current players as they couldn’t comprehend what I was going through. It might sound selfish, but it can in some small part be compared to losing a loved one. I found more solace in speaking with other retired players as they knew exactly what it is like to lose the structured environment and the opportunity to play the sport you love at a professional level. Did you maintain your fitness? For the first 6 months I kept active in the gym and out running…since then not so much! I’m making a conscious effort to get out and do something 2/3 times per week as a minimum since I’m back home. Did you study whilst playing? I completed a Commerce degree in UCC and then I finished a Diploma in Accounting and Corporate Finance the week of the 2008 Heineken Cup final. Looking back now I would have done probably a Masters before we had our first child. Time is luxury that is very limited now! Had you any dealings with IRUPA (as it was)? I’m probably like most players in that it wasn’t until I knew my time was coming to an end that I properly engaged with a Player Development Manager (PDM). Derval O’Rourke was the Munster PDM during that time, followed shortly by Marcus Horan which was great in a sense that they happened to both be former professional sportspersons and knew what the experience was like first-hand. After being through retirement myself and now joining RPI, I can see that there’s a lot that I can put into practice that can help support the roles of PDM’s. I can guarantee that most guys, like myself, can retire with no real plan in place and need a job sooner than later so lean on the PDM’s for job prospects. The reality is that most jobs will come down to contacts and connections and the PDM’s main role is to offer career guidance rather than being a recruiter. 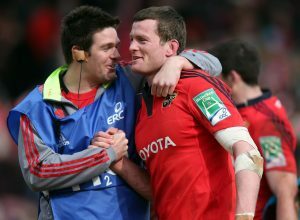 We all have family, friends, AIL club connections, etc., but possibly the most beneficial network for retired players are the guys who have retired from the professional game, who are out working across many different industries for a number of years and, maybe more importantly, understand what transitioning players are going through. The big one for me is that after having our first child later in my career, it put my job as a professional rugby player into perspective. I put so much focus on doing things “right” that I look back at how I lost along the way that it still is just a sport and as a result of this perspective I didn’t play as freely and as confident in myself as I did when I first started out. One guy and former teammate who has hit new heights in his career is Keith Earls. From reading and listening to some of his interviews, I can see that he is in a great headspace and getting the absolute maximum out of himself. The simple reason is that he puts rugby down the list of priorities in his life, behind his family. When he makes a mistake on the field he can quickly put it into perspective that it’s not a major incident in the greater scheme of things. This is the mindset that I would have loved to have played with – free from my own fear. Any particular highlights that stand out? 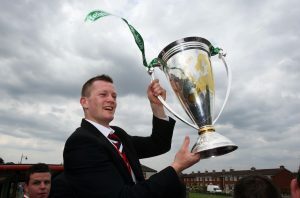 Winning the Heineken Cup in 2008 in my rookie season was a definite highlight. Along the way we had some really satisfying wins in Europe on the road and the game where I felt we played the most accomplished performance was against Northampton in the final pool game in 2012. There is great satisfaction in beating a strong opposition whilst putting together an almost complete performance for the full 80 minutes. It’s rare. If you were starting out in the game again, what advice would you give to a young Denis Hurley? Live the game but love it for what it is – a game. Get a lot more work experience done during days off and during holidays. Experience different companies and different departments, and this way you can at least figure out what you DON’T like. Make connections with people in business and stay in touch. You never know how or when you may need to call on them for advice, support or even a job.